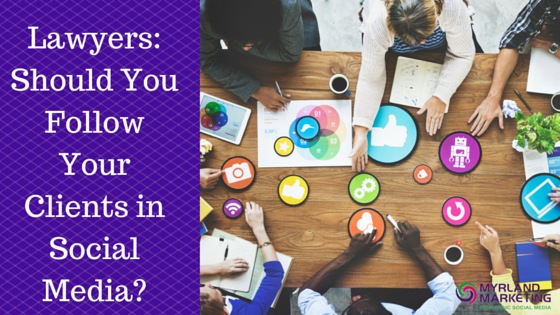 The Myrland Marketing Minute Blog Lawyers: Should You Follow Your Clients In Social Media? Friend them on Facebook (again, if you already have some sort of connection to them). The reason to follow, friend or connect with these people is that you want to know what they and their companies, and even their families if they post that, are up to. This shouldn’t be viewed as creepy, but that it helps you become even more informed about them, and helps give you ways to connect with them on a deeper level. Compare this to getting to know them at an event. There are legal and ethical exceptions about not friending those you are opposing, etc., but if we are talking about purely for relationship and connection-building with clients, potential clients and other influencers, I would say yes, you should connect with them. As suggested above, you can also set up a column in TweetDeck or Hootsuite, or a search on LinkedIn, and even a special list on Facebook that contains the names of valued or target clients, or other parties such as referral sources and media, then you can quickly go to that column and list to see if there is anything interesting or educational going on with them. This also gives you something to comment on, something of theirs to like or share, and helps build relationships, which is one of the main reasons you are there, right? Hey Nancy, What About Firm Accounts? On your firm’s Twitter account, I would have the same answer. If one’s service provider chooses to follow him/her from its business account, that is not a bad thing, and even shows interest and an additional form of connection. Your LinkedIn “Company” page does not follow others, so there is no need to worry about that. Your firm’s Facebook Page can “like” others’ Facebook Pages, showing yet another form of connection and brand exposure, as well as to potentially see what they post…that is, if Facebook’s algorithms decide there has been enough contact between the two to actually show you what they’ve posted. Facebook’s algorithms only showing you certain content is a much longer story for another post, not to mention they have those algorithms locked away in a vault far below the Earth’s surface, much like the Original Recipe for Kentucky Fried Chicken. Okay, maybe that was a slight exaggeration. Yes, I think it is perfectly fine, and even desirable, to follow clients and potential clients in Social Media. Stay ahead of advertising and ethics rules. Don’t mess with those. I mean it! Send customized invitations to connect on LinkedIn, helping the recipient understand who you are. Only send those invitations to connect on LinkedIn if you have a reason to connect, otherwise you could get flagged. On all platforms you use, spend time watching their updates, and comment on, like and share what they post. Initiate conversation that helps you get to know one another. Don’t sell if you haven’t spent time earning their friendship and trust. Any more questions….I’m right here! I’d also like to thank my friend, Liz Cerasuolo, Director of Communications at the law firm of Fish & Richardson P.C., for encouraging me to turn this conversation into a blog post. Thanks Liz. I appreciate you! 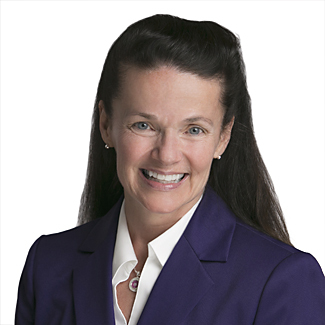 Nancy Myrland is a Marketing, Content, Social and Digital Media Strategist, Speaker & Trainer, helping lawyers, law firms and legal marketers grow by strategically integrating all marketing disciplines. She is a frequent LinkedIn, Twitter & Facebook trainer, as well as a content marketing specialist. She helps lawyers and legal marketers understand how to make their marketing and business development efforts more relevant to their current and potential clients, and helps lead firms through their online digital strategy when dealing with high-stakes, visible cases. As an early adopter of social media and digital technology, she also helps firms with blogging, podcasts, video marketing and livestreaming. She can be reached here.